As the weather gets colder around here, more hearty meals and soups have been dispatched from my kitchen. Last week was really cold, temperature dropped to 5°C, schools were off because of the storm. We had many “Raclette” nights and casual dinners with friends and neighbors. After all who wants to be out in that rainy weather! We simply enjoyed the laid-back inside with the fireplace on to warm up the atmosphere. 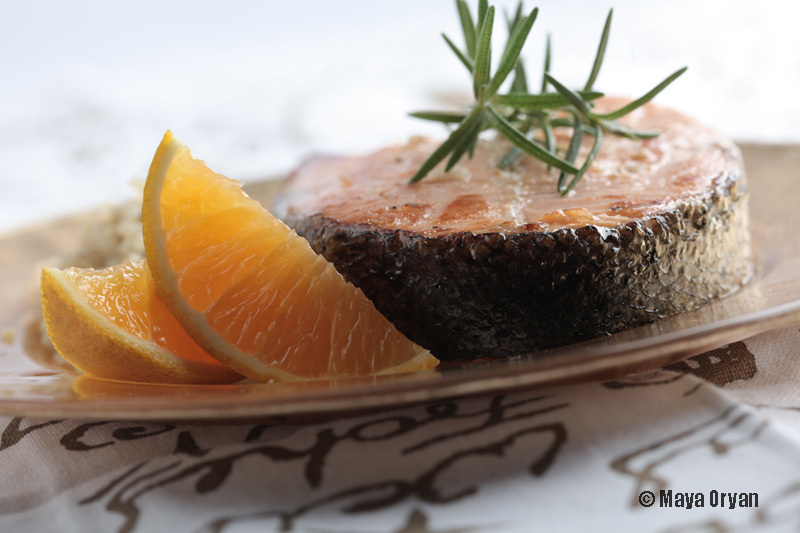 One of my favorite quick-fix meals is Orange Marinated Salmon. It comes together really quickly! It’s entirely stress-free and enormous success. Don’t you love that? Serve it with Basmati rice, baked potatoes or Fettucine. This dish is a glam! In a shallow pan, place fish as one layer and sprinkle with salt and pepper rubbing both sides of each fillet. Combine the rest of the ingredients and drizzle over the salmon to coat well all pieces. Refrigerate for 1 hour. Drain marinade. Lightly grease a baking dish with cooking spray and bake uncovered at 180°C or 350°F for 15mn to 20mn or until fish flakes easily with a fork. Note: If desired, reduce 1 cup of the marinade over low-medium heat until it thickens and serve it as a sauce. This entry was posted in Main Course, Recipes and tagged dinner menu, festive dish, food photography, Food Styling, Food Stylist, lebanese food blogger, Lebanese food stylist, Maya Oryan, Mayas Ingredients, Orange Marinated Salmon, red wine vinegar, Rosemary, Seafood by Maya Oryan. Bookmark the permalink. Oh I’ll be trying this one, thanks for the recipe! oh wow that looks delicious. Definitely one to try out! Thank you:) I bet you will like it! This is almost the same way I love to marinate salmon 🙂 It tastes so beautifully marinated with orange juice and honey.. This looks so good. I just was at the market and looked at salmon. Now I have buyers regret. I love the orange, honey, and rosemary blend. This is definitely on my list now to make! I hope you don’t mind if I reblog your link on my reblog page? It’s an honor:) Go ahead! Yumm!!! Love Salmon so I I nominated you for the liebster award! Check out my blog for details and if you are interested I can e-mail you a set of questions to participate. Thanks a lot, but I was nominated a month ago and participated. Thank you for liking my blog!! Best! Coming from a nutritionist, I feel so flattered! Thank you for stopping by, hope to see you more often. So simple and yet delicious!